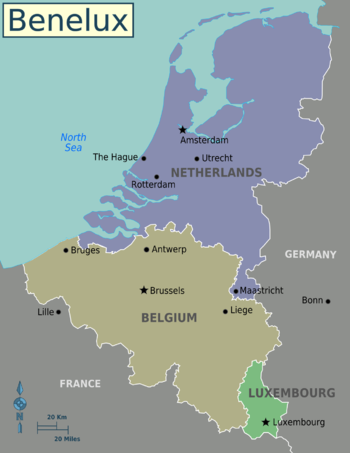 Benelux is an economic union comprising three neighbouring monarchies, Belgium, the Netherlands, and Luxembourg. The name is formed from the beginning of each country's name. It is a precursor of the European Union. Luxembourg — capital of Luxembourg, its spectacular valleys and plateaus led it to be nicknamed the "Gibraltar of the North"
Beringen — former important coal-mining city in Limburg, with a large industrial heritage site and pitoresque mining estate. West Frisian Islands - These islands (Wadden Eilanden) in the north of the Netherlands are well worth a visit for their beaches and their natural beauty. Limburg — has a solid reputation as a cycling paradise. Luxembourg and the East of Belgium is a hilly area, but the rest of the area is what is known as the the Low Countries; this is the delta of the rivers Scheldt, Meuse, Rhine and Ems. Originally swamp land, enterprising fishermen discovered a flair for trade when trading routes started to emerge between the grain markets of the Baltic Sea and the renaissance-bitten luxury goods markets of northern Italy. Here is where stocks were invented. This attention to trade made Bruges one of the largest cities in Europe in its day, and the mediaeval town is still well preserved. When the secession war with Spain progressed, French and Flemish alike fled to Amsterdam, which became the new world capital of trade, which is still witnessed in the many 'Houses of the Lords' lining the famous canals. Dutch is the main language in the Netherlands and in the north of Belgium (Flanders) where it is also known as Flemish, and is also spoken (by about 15% of the people) in bilingual Brussels. French is the main language (85%) in Brussels, and in all of the south of Belgium (Wallonia) with the exception of the eastern side of Wallonia where you will find the Belgian German speaking community. In Belgium, while most Dutch speakers can speak reasonable French, few Belgian francophones speak Dutch, which has caused political tension in the country. Luxembourg has three official languages: Luxembourgish, French and German, but for all practical purposes French is the most important language for travelers. Many people, especially in the Netherlands and Flanders (Northern Belgium), can speak English. This is considered to be because of english subjects at a young age, and television and movies, which are shown in their original languages with subtitles. Especially when you go to Wallonia, where TV is dubbed into French, people are not so good at speaking English. Frisian is a minority language spoken in Friesland (Netherlands). Most people get into the Benelux region by plane or train. Schiphol Airport in Amsterdam and Zaventem Airport in Brussels are the largest airports in the region; Schiphol is also important as a transfer airport for further destinations in Europe. Smaller regional airports are present in Antwerp, Eindhoven, Maastricht, Charleroi(Brussels South) and Rotterdam, which are mostly used by low-cost carrier airlines. High-speed rail networks connect the Benelux with France, Germany, and the United Kingdom. High-speed trains operated by Thalys  connect Paris with Brussels, Antwerp, Rotterdam, and Amsterdam in a little more than three hours. Slower Intercity trains connect Amsterdam with Berlin, Cologne, and Frankfurt in Germany. Much of the swamp land in the Low Countries has been reclaimed, resulting in some of the largest water works in the world, such as the Delta Works, and in other attractions such as the windmills of Kinderdijk in South Holland. Much has not been reclaimed, resulting in interesting biotopes, such as the Zwin on the North Sea Coast of Belgium and the area around the Wadden Sea in the North of the Netherlands. So, what to see in Luxembourg? Try its capital of the name, with a splendid location high on a cliff, or Vianden, a tourist favourite with its stunning mediaeval Beaufort Castle. You will find white-water canoeing in Luxembourg and the East of Belgium. There are some excellent golf courses in Luxembourg and the East of Belgium. Rent a bike and explore Amsterdam. Try Moules et frites (Mosselen met frieten)- Belgium's answer to fish and chips. Try speculaas, the famous Belgian cookies. Belgian chocolate is some of the best on the planet. Eat the Dutch almond fingers, rich with sugar and marzipan. Try the famous Belgian brewed beers! Possible day-trips include the historic cities of Lille and Aachen, that are just over the border in respectively France and Germany. Many Europe-trippers take the train to Berlin with a possible de-tour of Quedlinburg on the way. This page was last edited on 3 July 2018, at 08:35.